The BBC recently announced the results of their annual ‘Price of Football’ study and there was plenty to chew on in the findings. Not least in the revelation that Manchester United would have to sell 75,715 pies to cover just a week of Falcao’s wages. Coincidentally, a colossal number of pies appear to be what Harry Redknapp thinks Adel Taarabt is spending his wages on. Overall, and unsurprisingly, the price of watching football in the UK was found to be steep and rising. The study notes that ‘the average price of the cheapest tickets across English football has risen at almost twice the rate of the cost of living since 2011.’ The Football Supporters’ Federation called the increases “completely unacceptable” but it seems that many fans do accept them – Premier League attendances are on the increase. Remarkably, ‘Charlton’s £150 season ticket is the cheapest in England’s top four divisions. However, Barcelona charge around £103 for their lowest-priced season ticket.’ I’ve seen Barcelona at the Nou Camp twice and it’s a thrilling experience (although it must be said that the catering facilities for example are quite awful). I think I paid about €20 in 2010 for a La Liga game against Malaga and about €27 a year later for a league match against Real Zaragoza. I’ve never had the pleasure of seeing Charlton at the Valley but I imagine it’s a slightly different experience to the Nou Camp. The report generated some interesting responses. Most interesting of all was the solution that Sunderland came up with. Just a few days after the report was published they played so badly at Southampton that they lost 8-0 and the goalkeeper offered to refund the costs incurred by their fans. In midweek, Danny Baker (well worth a follow on Twitter by the way if you’re into that sort of thing @prodnose) questioned why Chelsea fans had bothered to pay expensive prices to see their team demolish Maribor 6-0 in the Champions League. His point wasn’t so much about the prices as about what he sees as the devaluation of the tournament caused by over-expansion. In Baker’s view, a near full-house at Stamford Bridge for such a game represents a triumph of branding by UEFA. The Champions League is indeed a branding masterclass but it can also be considered a genuinely premium product. While there were some very large victories in the tournament this week due to a huge gulf in resources and quality between opponents, it was not true in all cases. Bayern Munich beat Roma 7-1 and I think most people would consider that a clash between two big European clubs and very much worthy of the Champions League setting. Roma happen to be my favourite Italian team and I’ve seen them live twice. The first time was in 2009. Roma happened to be playing Juventus the weekend that my wife and I were visiting the eternal city (this, I must confess, was not entirely a coincidence). We arrived in the city late on a Saturday evening, the night before the game and all the ticket offices were shut as was the club shop. The next day, my wife’s priority, quite rightly and naturally, was sightseeing but mine was to obtain a ticket. By midday, and with several hours of sightseeing already completed, we arrived at the Roma store where match day tickets could be purchased. I waited patiently in a ticket queue that was comprised mostly of tourists. When I got to the front I said: “uno ticket for today’s calcio, grazie.” I like to use a bit of the local lingo where possible. With a slightly trembling hand I offered up my credit card. 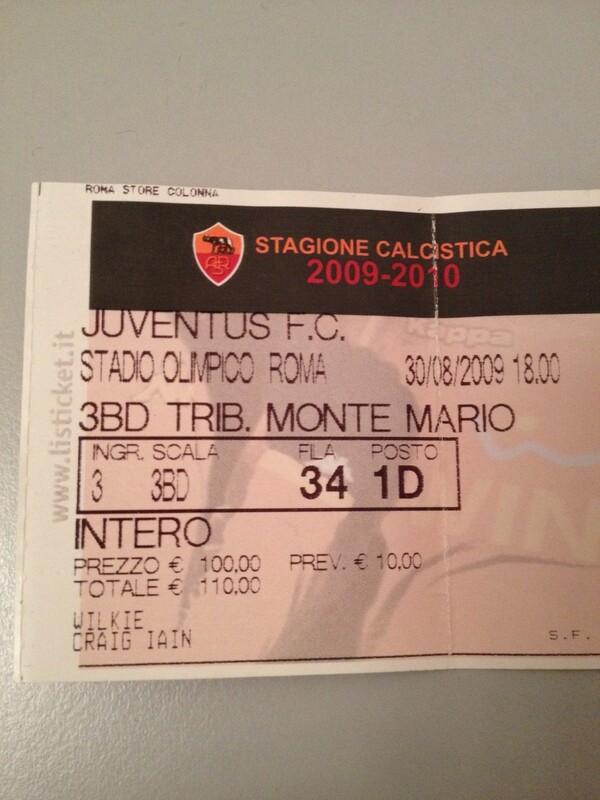 Still smiling, the Italian woman explained that the only tickets left were in the most expensive part of the stadium. Later, inside the stadium I judged by the empty seats in other areas that this may have been a lie. I left the official Roma store with a slightly dazed sensation and clutching what felt like one of Willy Wonka’s golden tickets. Roma lost 3-1 and never offered a refund. That is the most I’ve ever paid for a ticket. Many European clubs have a steeply tiered pricing system with very expensive tickets at one end and very affordable ones at the other. Of course only the biggest clubs with the best players can operate those sorts of pricing policies, other clubs have to be more creative and make more of an effort. 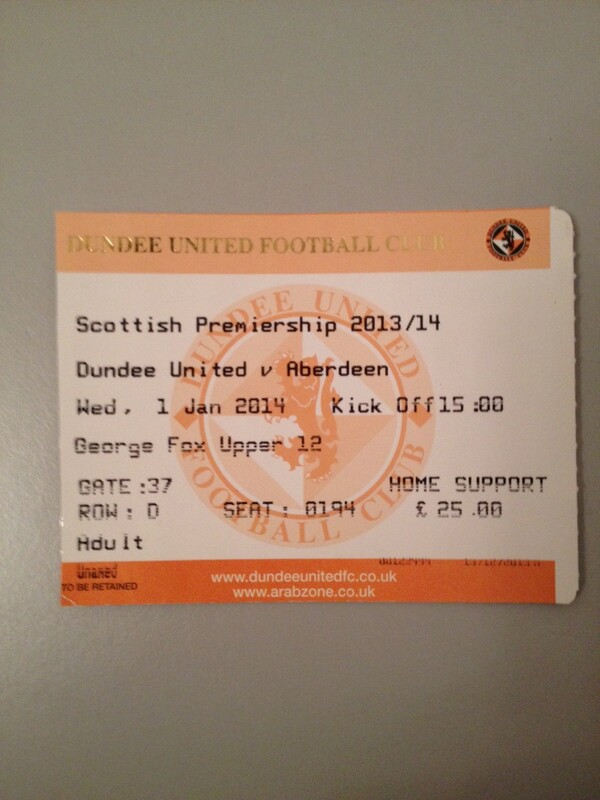 Living abroad, I very rarely get to see my home town team Dundee United these days. The last time I was at Tannadice was on New Year’s Day this year when my brother and I went to see United versus Aberdeen. I paid £25 for the ticket. Scotland in January is generally very wet and very cold. So it was for the Aberdeen game. We shivered through a 2-1 defeat with the pie and tea providing only a brief respite from the cold and ran back to the car through torrential rain. Happy New Year! In my view £25 is too much to pay for the quality that’s currently being offered in Scotland’s top flight and I wouldn’t be inclined to pay it regularly. I say that despite the fact that my club are currently doing an excellent job of bringing through exciting young players and adopting an entertaining style of play. To be fair though to United and many other Scottish clubs, they are making some effort to contain prices and improve the experience for fans. United offer some good discounts for kids and seem to do a good job of engaging with season ticket holders. They’ve also started doing some reciprocal deals with other clubs for specific matches to lower prices for away fans. When I lived in Scotland I was a regular at Hampden for Scotland games. Sadly following Scotland has mostly involved heartache for my entire adult life – I was 17 the last time we qualified for a major championship. The team’s recent resurgence under Gordon Strachan has offered the greatest hope in the entire period since. It was therefore hugely disappointing that the recent European Championship qualifier against Georgia at Ibrox was played against a backdrop of so many empty seats. The cheapest ticket for the game was £35 and 17,000 empty seats was a stark illustration of how badly the SFA have misjudged the pricing policy for these games. The cheapest tickets for next month’s friendly against England are priced at £50. I think the motivation for staging that game is pretty obvious. The tartan army have reacted quite furiously to all of this. Online petitions have been launched and t-shirts with the slogan Shafting Fans Always are apparently selling well (people are obviously prepared to pay money to protest at how much money they’re being asked to spend). Recent years have seen quite a lot of progress in supporters taking a stand and getting together to represent themselves. Just as the influence of workers has weakened with the erosion of trade union power so the influence of fans has been diluted at many clubs for whom ticket revenue makes up a much smaller proportion of overall revenue than it once did. Football supporters are among the most loyal groups of people anywhere, far more loyal than the average employee or customer is to any particular company. That loyalty is not without limits though. Any club or football association that continually takes fans for granted will eventually pay a heavy price, when those supporters stop doing so.